Target gift cards are always usable! Really love this site…saves us money thank you!! Fingers crossed. I need a pick me up today. Maybe this will be it. It is nice of Kerry to give away cards every week. Love your giveaways and website. 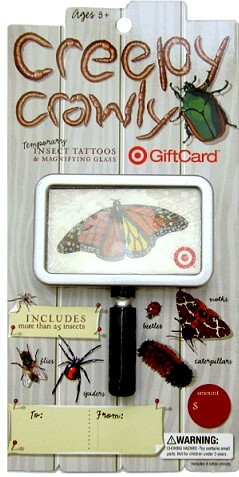 My girls LOVE bugs and would love those tattoos! Thanks for the giveaway! Already ‘like” you on Facebook! This would really come in handy…we just found out we are having a boy and all i have are girl clothes! LOL Thanks for the chance to win! I would love to win this! Shop at Target every week and love your blog! Thank you so much for the opportunity to win this amazing prize! Love this gift card, how fun! I’ve liked you for a long time!!! What a cute gift card. Thanks for the chance to win it. I like you on FB!!!!!!!!!!! What a unique gift card.